Who has an ad blocker installed right now? After being followed around the web by a shoe ad (or “retargeted”) I finally gave in and installed an ad blocker over the holidays. 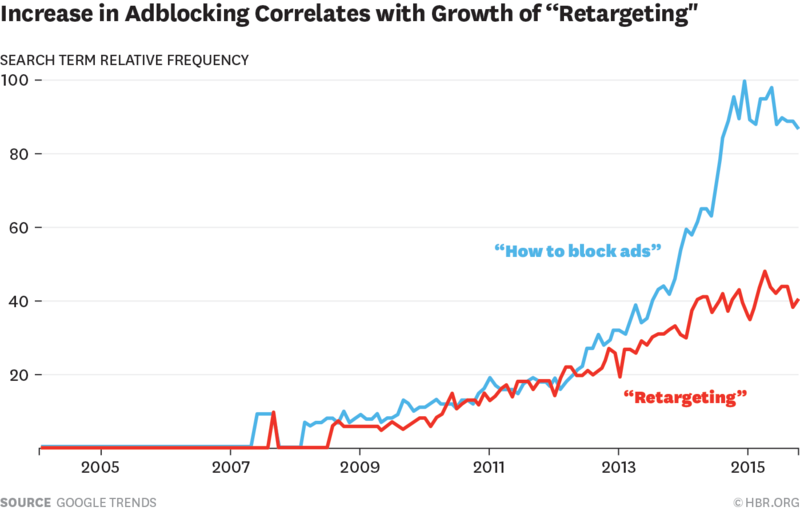 Turns out, retargeting from brands has been a large contributor to the rise in ad blocking (see graph below from this HBR article). It makes sense, right – people get irritated when a brand stalks them around the web without permission. Given the ad blocking angst in the ad tech industry, I’ll be watching what pundits are calling the “Me2B” economy or Personal Information Economy in 2016. In the Me2B economy, people are agents of their own information, choosing which brands they rent their data to, rather than advertisers stalking them and tracking their data without proper consent. I wrote about this trend a few years ago after reading Doc Searles book called The Intention Economy: When Customers Take Charge. In the book, Doc outlined how he expects the market to change once consumers are increasingly empowered. So, it is fascinating to see the Me2B economy take shape – behind ad blocking. As ad blocking gets more sophisticated, new “opt-in” models of ad blocking are emerging. Been Choice is an app giving users the option to proactively opt-in to earn points/rewards while allowing (some) ads through the blocker. I like the idea of a more transparent value exchange between the consumer and brand. Consumers provide active consent to receiving ads and no longer feel overly tracked on the Internet. Brands, via the “opt-in” model, get exclusive access to user data allowing them to personalize offers and expand relationship programs. Brands also have a fresh way to level the playing field vs the large walled gardens on the Internet who control much of the world’s consumer data today.